NANOCON has achieved high heat resistance, dimensional accuracy and a good appearance compared with normal polyamide 6. In addition to the chemical resistance with the original polyamide 6 resin, it also has weather and light resistance due to Unitika’s original prescription. Because of its excellent strength and rigidity which is the greatest feature derived from Unitika’s independent filler compounding technology, NANOCON is also applicable to load-bearing parts, such as door handles. Thanks to “NANOCON” metallic resin’s high design property, it can be widely applied to familiar products other than automotive. 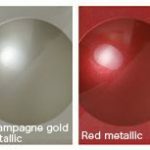 UNITIKA offers a way to reduce costs of metallic colored parts with NANOCON compounds with metallic appearance. “NANOCON” is a high-gloss material that features metallic brilliance, rigidity, heat resistance, and chemical resistance. As each silicate layer has almost the same size as a polyamide 6 molecule chain itself, nanocomposite molding items have an excellent surface appearance compared with the conventional reinforced materials. Metallic pigments in NANOCON shine brilliantly because the synthetic layered silicate has a fine white appearance compared with the natural layered silicate and NANOCON itself is colourless. Nanocomposite polyamide 6 “NANOCON” is a reinforced material based on the polyamide 6 with numerous ultra-fine inorganic fillers. NANOCON is a novel composite material which has completely different properties from conventional composite materials reinforced with “micron-sized” fillers, such as glass fiber and talc.